BAGHDAD, Iraq (CNN) -- Three U.S. soldiers were among at least 15 people killed in a suicide bombing on a U.S. military patrol in Baghdad on Thursday morning, Iraq's Interior Ministry said. U.S. soldiers examine the scene of a bombing Thursday in Kirkuk, Iraq, that killed eight Sons of Iraq members. Twelve civilians were killed and 25 were wounded in the bombing -- one in a series of deadly attacks that have hit Baghdad and other cities in recent days. The bombing occurred in the Athuryein neighborhood in southern Baghdad's Dora district, Iraq's Ministry of Information said. 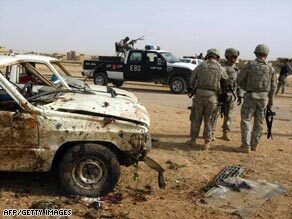 The U.S. military confirmed that an attack had taken place and that the three soldiers had died. However, it said it could not confirm reports that it was a suicide bombing and said the strike was caused by an improvised explosive device. In another attack, two police officers were killed and 20 people were wounded by a bomb hidden in a trash can in a police station in western Baghdad, officials said. Also, five people were wounded, including two police officers, when a roadside bomb exploded Thursday morning near an Iraqi police patrol in southeastern Baghdad, the Information Ministry said. Also Thursday, a bomber struck outside an army headquarters in southern Kirkuk, a city about 150 miles north of Baghdad, police said. The explosion killed seven Awakening Council members who were lining up to receive their monthly salaries. Seven other council members were wounded in the attack. The Awakening Council, also known as Sons of Iraq, is primarily a Sunni movement composed of former insurgents or sympathizers who have turned against al Qaeda. The U.S. military credits them for having played a key role in bringing about the nationwide drop in violence that coincided with the increase in U.S. forces in Iraq. Thursday's incidents follow a Wednesday bombing in Baghdad that was the worst attack in nearly a month. In that attack, a parked car bomb blew up outside a Baghdad restaurant, killing at least 40 people and wounding 83.